Dudley and his mate Molly came to the Refuge in 1994 as 5 year olds. They had been together since they were 6 weeks old. They were inseparable. If you saw one, you saw two. 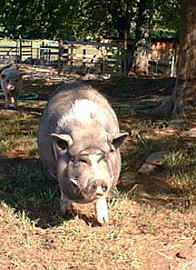 Dudley was the herd leader of one of the 5 herds here. In 1998 Molly became ill and after many tests and treatments she died of cancer. The last few weeks of her life she tended to stay away from the rest of the herd in a house out under the trees. After she died Dudley laid beside that house for 2 weeks grieving. Unwilling to eat or socialize I was afraid I would lose him too. He eventually resumed a normal life but has chosen to be a loner. He no longer socializes with his herd. He sleeps alone and travels alone. The Grieving that Dudley went through and is most likely still experiencing is no different than that experienced by human beings. If you have lost a loved one, then you know how Dudley felt when Molly died, and how he still feels, today, because God gave us all the same kinds of feelings. When I first read about Dudley, I saw in him the same mourning that I've seen and many humans whom I've ministered to in my capacity as a pastor. If you have read the Story of Nathan and Travelin, you have seen the same feelings being expressed by a cat. Animals are not objects or things, and they shouldn't be possessions either. They are fellow living souls, who live their lives much in the same way that we do. They love, they fell joy, and they feel sorrow, and more importantly, they fear and feel pain just as we do. But despite these very obvious facts, we continue to brutalize and slaughter about 9,000,000,000 Dudleys and other land animals each year in the United States, alone. What we have done to these animals is evil. It time we repent of our ways and stop raising them for food.